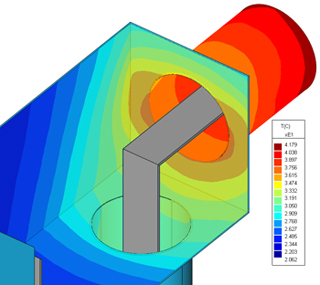 INDUCTO 3D program provides coupled electromagnetic and thermal analysis in the 3D domain. The eddy current simulation capabilities of FARADAY are linked to the thermal analysis capabilities of CELSIUS to provide a complete solution for induction heating problems. 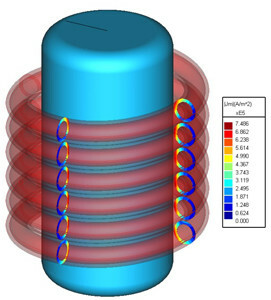 INDUCTO 3D can perform both transient and steady-state simulations. In addition, the FARADAY and CELSIUS modules can be used separately when coupled simulations are not required. 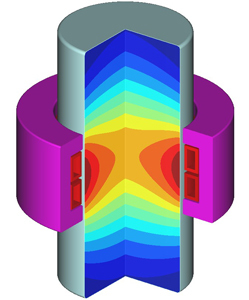 3D magnetic and thermal analyses field solver applications involving inductive heating. 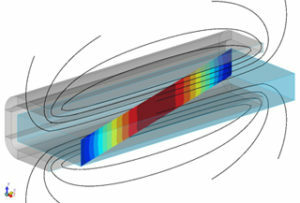 Accurate calculation of induced eddy currents is the foundation of coupled electromagnetic/thermal simulations. 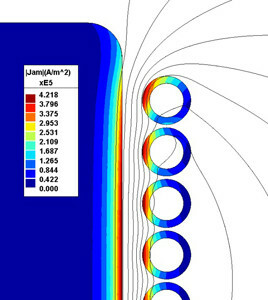 Eddy current field simulations can be performed using either Self-Adaptive Boundary Element Method (BEM) or Finite Element Method (FEM) solvers. BEM is particularly well suited to open region problems (encountered in air core inductors) while FEM can easily accommodate transient problems.